Monday September 29th 1924 I ironed what spare time I had till three oclock. Wrote Fannie and went up town to mail letters. Laura at school in PM. Evening at home. Tuesday September 30th 1924 I finished the ironing by noon. I got in Venes room in afternoon to do mending. Laura in school. Rev Clark & wife called. Martie & Charlie away of an errand in the evening. Letters from Fannie & LeGrand. 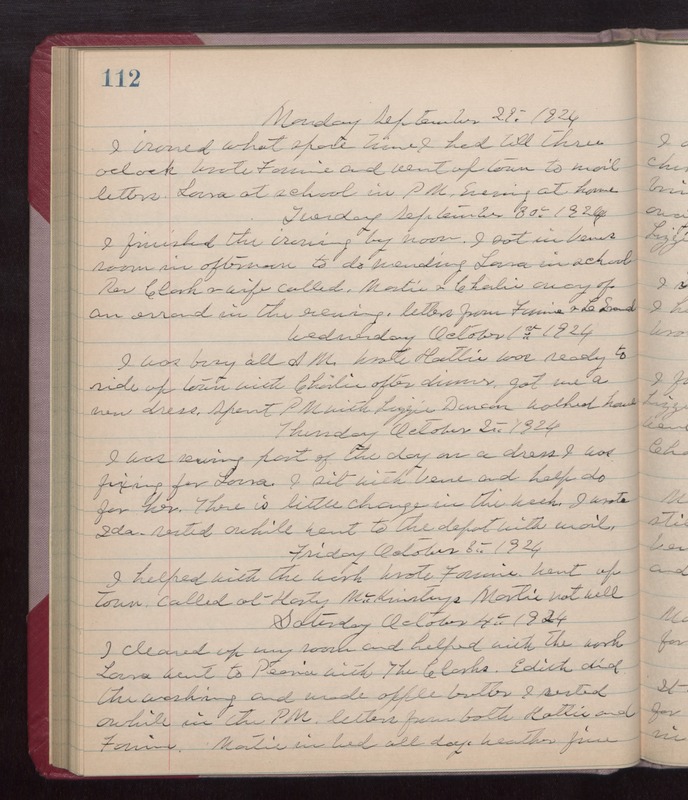 Wednesday October 1st 1924 I was busy all AM. Wrote Hattie. Was ready to ride up town with Charlie after dinner. Got me a new dress. Spent PM with Lizzie Duncan. Walker home. Thursday October 2nd 1924 I was sewing part of the day on a dress I was fixing for Laura. I sit with Vene and help do for her. There is little change in the week. I wrote Ida. Rested awhile. Went to the depot with mail. Friday October 3rd 1924 I helped with the work. Wrote Fannie. Went up town called at Harty McKinstrys. Martie not well. Saturday October 4th 1924 I cleaned up my room and helped with the work. Laura went to Peoria with The Clarks. Edith did the washing and made apple butter. I rested awhile in the PM. Letters from both Hattie and Fannie. Martie in bed all day. weather fine.